Find Conscious Hotel Museum Square deals, discounts and special offers. Call for even better deals! Rates and availability vary for this hotel. Search the web here for the best rates. Located near Dam Square in the heart of Amsterdam, this hotel is set in 17th and 19th century buildings on the canal. Located opposite the Central Station, this historic hotel features two on site restaurants and bars. Located in the old city center, this hotel is housed in 25 restored 17th and 18th century canal houses. 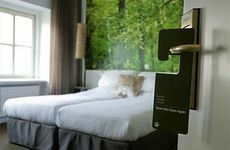 Just 15 Minutes from Schipol Airport, this hotel features an on site breakfast restaurant and a lounge. Located in the heart of Amsterdam, this hotel offers the Restaurant De Roode Leeuw serving Dutch regional specialities. Located in the heart of Amsterdam's historic center, this hotel features a pool, fitness center and a restaurant. This former historic shipping house features a pool, restaurant, complimentary in room minibar and a central location. Dating from 1867, this historic hotel offers a French-Mediterranean restaurant, a pool and views of the Amsel River. This former bank building, next to a typical canal bridge, offers complimentary breakfast and unlimited drinks/snacks. Housed in a converted 18th-century mansion, the Hotel Roemer is a trendy boutique hotel with a stylish interior. Set in a 19th century school building, this hotel is run by students and features the popular College Restaurant. This centrally located hotel is just a five minute walk from the Rijksmuseum and Van Gogh Museum. This Amsterdam hotel features a large underground parking garage and a restaurant & bar with a waterside terrace. Set in the Apollolaan District, the canal-side Hilton Amsterdam features three on-site restaurants and bars. Located in southern Amsterdam, the Park Plaza Vondelpark features an on-site bar & lounge and free internet access. Signup below to create personalized hotel deal alerts and get great hotel deals in the places that interest you. You can unsubscribe at any time. Promise. Didn't find the perfect hotel deal? Call to book even lower rates too low to show on our site!